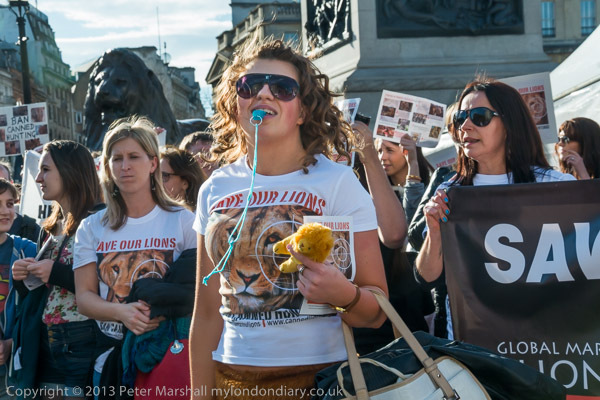 Landseer’s Lions were joined by a couple of hundred protesters, some dressed as lions or with lion images on their t-shirts with the message ‘Save Our Lions’. The photographic difficulty in putting the two together was largely that the sun was low and more or less exactly in the direction I wanted to point my camera, just outside the frame above. I was using the Nikon 18-105mm on the D8o0E, and it is a DX lens, so at 50mm was 75mm equivalent. The 28-105 has a reasonably effective lens hood, but I needed to use my hand as well – and being able to see in the viewfinder the image area outline as a rectangle over a larger view makes this a little easier. Trafalgar Square was in a little of a mess, with tall fences around the plinths of the lions, so it wasn’t possible to use them well in closer images. A wider image (18 mm on that 18-105) taken from the same position a few seconds earlier gives a clearer view of the situation as well as showing the main banner for the event. 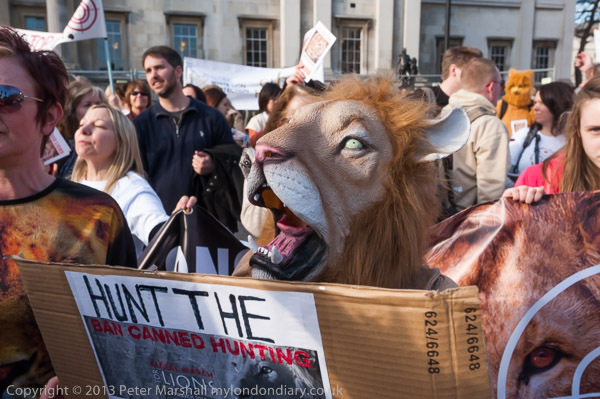 As you can see in Save Our Lions – Ban Canned Hunting I took quite a few different images from that same spot. AAfter quite a lot of the march had passed me, I ran up around the side of the march (it had been joined by another group of marchers that the people carrying the banner had been pointing towards) and got to the top of the steps going up to the North Terrace to photograph people coming up. Again I made a series of images. At the top on the North Terrace things were very crowded, particularly as preparations were being made there for the St Patrick’s Day celebrations the following day and the space for the protest was rather restricted. It wasn’t always possible to get enough clear space between camera and subject for some pictures and I think I could have done a little better on pictures like the above. 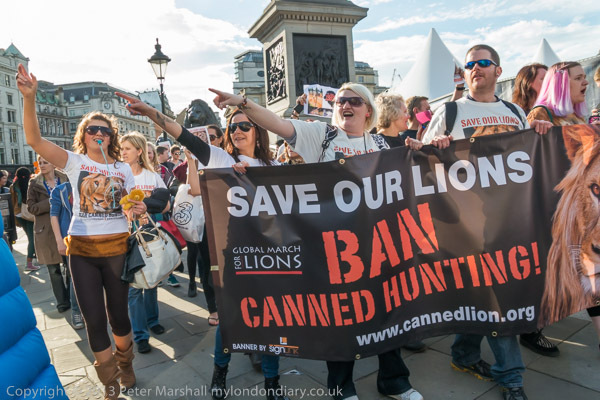 I hadn’t really realised what was happening with the lions and ‘canned hunting’ and it’s significance, so this was a protest where I learnt something. 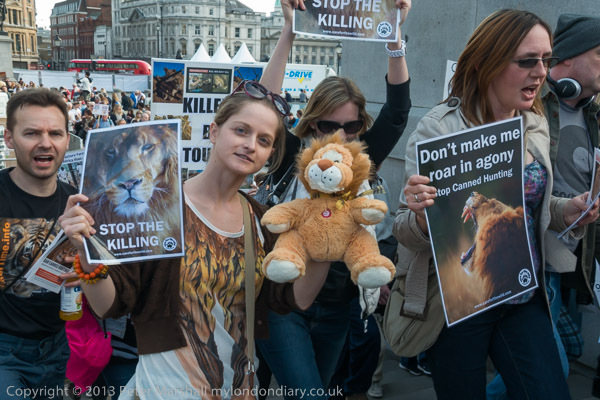 It’s a practice which degrades both the ‘King of the Beasts’ and the miserable rich who take part in it. This entry was posted on Monday, April 14th, 2014 at 09:19 am and is filed under My Own Work, Photo Issues, Political Issues. You can follow any responses to this entry through the RSS 2.0 feed. You can leave a response, or trackback from your own site.